Jesus continued to say to all of them, "If any person wants to follow me, he must say 'No' to the things he wants. 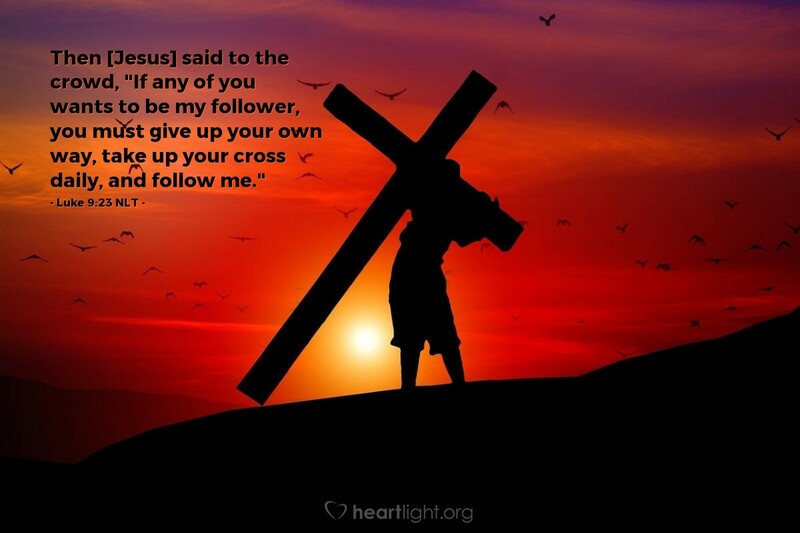 That person must accept the cross (suffering) that is given to him every day, and he must follow me. If we are going to be one of Jesus' followers, one of his disciples, we're going to have to be willing to walk in the way of the Cross. That means giving up our selfish ambition and pride. That means we live to honor Christ and to bless others in his name. And our trip to the Cross must come every day. Father, may I never claim glory except for the glorious grace you have given me in the Cross of Jesus upon which I have crucified my selfish desires and committed to trust in the salvation that is found in Jesus alone. In the Lord Jesus' name I pray. Amen.